Jewish emancipation was the external (and internal) process in various nations in Europe of eliminating Jewish disabilities, e.g. Jewish quotas, to which Jewish people were then subject, and the recognition of Jews as entitled to equality and citizenship rights on a communal, not merely individual, basis. It included efforts within the community to integrate into their societies as citizens. It occurred gradually between the late 18th century and the early 20th century. Jewish emancipation followed the Age of Enlightenment and the concurrent Jewish enlightenment. Various nations repealed or superseded previous discriminatory laws applied specifically against Jews where they resided. Before the emancipation, most Jews were isolated in residential areas from the rest of the society; emancipation was a major goal of European Jews of that time, who worked within their communities to achieve integration in the majority societies and broader education. Many became active politically and culturally within wider European civil society as Jews gained full citizenship. They emigrated to countries offering better social and economic opportunities, such as the Russian Empire and France. Some European Jews turned to Socialism, others to Jewish nationalism: Zionism. Jews were subject to a wide range of restrictions throughout most of European history. Since the Fourth Council of the Lateran in 1215, Christian Europeans required Jews and Muslims to wear special clothing, such as the Judenhut and the yellow badge for Jews, to distinguish them from Christians. The practice of their religions was often restricted, and they had to swear special oaths (see Oath More Judaico). Jews were not allowed to vote, and some countries formally prohibited their entry, such as Norway, Sweden and Spain after the expulsion in the late 15th century. In contrast, in 1264, the Polish Prince Boleslaus the Pious issued the "Statute of Kalisz" – The General Charter of Jewish Liberties in Poland, an unprecedented document in medieval history of Europe that allows Jews personal freedom, legal autonomy and separate tribunal for criminal matters as well as safeguards against forced baptism and blood libel. The Charter is ratified again by subsequent Polish Kings: Casimir the Great of Poland in 1334, Casimir IV of Poland in 1453, and Sigismund I the Old of Poland in 1539. After massive expulsions of Jews from Western Europe (England, France, Germany, and Spain), they found a refuge in the lands of the Polish-Lithuanian Commonwealth. During the Jagiellon Era Poland became the home to Europe's largest Jewish population, as royal edicts warranting Jewish safety and religious freedom from the 13th century contrasted with bouts of persecution in Western Europe, especially following the Black Death of 1348–1349, blamed by some in the West on Jews themselves. Large parts of Poland suffered relatively little from the outbreak, while the Jewish immigration brought valuable manpower and skills to the rising state. The greatest increase in Jewish numbers occurred in the 18th century, when Jews came to make up 7% of the Polish population. The rabbinate was the highest goal of many young Jewish men, and the study of the Torah (The first five books of the Bible) and the Talmud was the means to obtain the coveted position. Jewish involvement in gentile society began during the Age of Enlightenment. 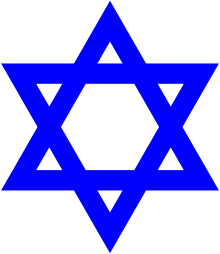 Haskalah, the Jewish movement supporting the adoption of enlightenment values, advocated an expansion of Jewish rights within European society. Haskalah followers advocated "coming out of the ghetto," not just physically but also mentally and spiritually. On September 28, 1791, France became the second country of the world, after Poland 500 years earlier, to emancipate its Jewish population. There were 40,000 Jews living in France at the time. They were the first to confront the opportunities and challenges offered by emancipation. The civic equality the French Jews attained became a model for other European Jews. Newfound opportunities began to be provided to the Jewish people, and they slowly pushed toward equality in other parts of the world. In 1796 and 1834, the Netherlands granted the Jews equal rights with gentiles. 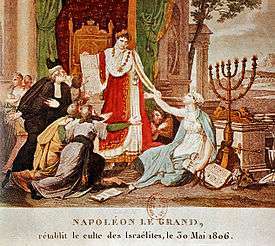 Napoleon freed the Jews in areas he conquered in Europe outside France (see Napoleon and the Jews). Greece granted equal rights to Jews in 1830. But, it was not until the revolutions of the mid-19th century that Jewish political movements would begin to persuade governments in Great Britain, Central and Eastern Europe to grant equal rights to Jews. The early stages of Jewish emancipation movements were part of the general progressive efforts to achieve freedom and rights for minorities. While this was a movement, it was also a pursuit for equal rights. Thus, the emancipation movement would be a long process. The question of equal rights for Jews was tied to demands for constitutions and civil rights in various nations. Jewish statesmen and intellectuals, such as Heinrich Heine, Johann Jacoby, Gabriel Riesser, Berr Isaac Berr, and Lionel Nathan Rothschild, worked with the general movement toward liberty and political freedom, rather than for Jews specifically. In 1781, the Prussian civil servant Christian Wilhelm Dohm published the famous script Über die bürgerliche Emanzipation der Juden. Dohm disproves the antisemitic stereotypes and pleads for equal rights for Jews. Till this day, it is called the Bible of Jewish emancipation. In the face of persistent anti-Jewish incidents and blood libels, such as the Damascus affair of 1840, and the failure of many states to emancipate the Jews, Jewish organizations formed to push for the emancipation and protection of their people. The Board of Deputies of British Jews under Moses Montefiore, the Central Consistory in Paris, and the Alliance Israelite Universelle all began working to assure the freedom of Jews. Jewish emancipation, implemented under Napoleonic rule in French occupied and annexed states, suffered a setback in many member states of the German Confederation following the decisions of the Congress of Vienna. In the final revision of the Congress on the rights of the Jews, the emissary of the Free Hanseatic City of Bremen, Johann Smidt - unauthorised and unconsented to by the other parties - altered the text from "The confessors of Jewish faith are preserved the rights already conceded to them in the confederal states", by replacing a single word, which entailed serious consequences, into: "The confessors of Jewish faith are preserved the rights already conceded to them by the confederal states." A number of German states used the altered text version as legal grounds to reverse the Napoleonic emancipation of Jewish citizens. The Prussian emissary Wilhelm von Humboldt and the Austrian Klemens von Metternich promoted the preservation of Jewish emancipation, as maintained by their own countries, but were not successful in others. During the Revolutions of 1848, Jewish emancipation was granted by the Basic Rights of the Frankfurt Parliament (Paragraph 13), which said that civil rights were not to be conditional on religious faith. But only some German states introduced the Frankfurt parliamentary decision as state law, such as Hamburg; other states were reluctant. Important German states, such as Prussia (1812), Württemberg (1828), Electorate of Hesse (1833), and Hanover (1842), had already emancipated their Jews as citizens. By doing so, they hoped to educate the gentiles, and terminate laws which sought to oppress the Jews. Although the movement was mostly successful; some early emancipated Jewish communities continued to suffer persisting or new de facto, though not legal, discrimination against those Jews trying to achieve careers in public service and education. Those few states that had refrained from Jewish emancipation were forced to do so by an act of the North German Federation on 3 July 1869, or when they acceded to the newly united Germany in 1871. The emancipation of all Jewish Germans was reversed by Nazi Germany from 1933 through World War II. In some countries, emancipation came with a single act. In others, limited rights were granted first in the hope of "changing" the Jews "for the better." The emancipation disrupted the relationship the Jews had with their religion, which could not govern any longer all the actions in their lives. Many considered a practice of Judaism more closely to the lifestyle of their non-Jewish fellow citizens. The emancipation in France, Italy, Germany, at least during the Empire, permitted many Jews to leave the ghettos and contribute, as a result of the Haskalah, to the development of Reform and Conservative Judaism at the beginning of the 19th century. The emancipation contributed moreover to the assimilation of Jews and sometimes to their cultural disappearance when Jews merged through marriage in the surrounding society. It was not until Rabbi Samson Raphael Hirsch defined a modern vision of orthodox Judaism, enabling orthodox Jews to participate fully in a society. Ultimately, emancipation immersed the Jews into a new culture. In doing so, Jews were able to not only see themselves as members of a religious sect, but also as citizens within society. At the same time, however, some were concerned that leaders within the Jewish movement were seeking to position Judaism with an approach catered toward a new Western civilization. ↑ Eli Barnavi. "Jewish Emancipation in Western Europe". My Jewish Learning. Retrieved 25 September 2013. ↑ Shmuel Ettinger. "Jewish Emancipation and Enlightenment". Retrieved 25 September 2013. ↑ Paula E. Hyman, The Jews of Modern France (Berkeley: University of California Press, 1998), pp. 17-18. 1 2 3 "EMANCIPATION". Jewish Virtual Library. Retrieved 25 September 2013. ↑ Nicholas, de Lange; Freud-Kandel, Miri; C. Dubin, Lois. Modern Judaism. Oxford University Press. pp. 30–40. ↑ Barbara Stollberg-Rilinger: Europa im Jahrhundert der Aufklärung. Stuttgart: Reclam, 2006 (2nd edition), 268. ↑ In the German original: "Es werden den Bekennern des jüdischen Glaubens die denselben in [von, respectively] den einzelnen Bundesstaaten bereits eingeräumten Rechte erhalten." Cf. Heinrich Graetz, Geschichte der Juden von den ältesten Zeiten bis auf die Gegenwart: 11 vols., Leipzig: Leiner, 1900, vol. 11: 'Geschichte der Juden vom Beginn der Mendelssohnschen Zeit (1750) bis in die neueste Zeit (1848)', p. 317. Emphasis not in the original. Reprint of the edition revised by the author: Berlin: Arani, 1998, ISBN 3-7605-8673-2. 1 2 C. Dubin, Lois. Modern Judaism. Oxford University Press. pp. 32–33. ↑ "THE DEVELOPMENT OF MODERN ANTI-SEMITISM: images pg.21". Friends-partners.org. Retrieved 2015-02-17. ↑ Jean Jaurès. "Law Relating to the Jews 1791". Marxists.org. Retrieved 2015-02-17. ↑ However, reversed by the Westphalian successor states in 1815. Cf. for introduction and reversion Heinrich Graetz, Geschichte der Juden von den ältesten Zeiten bis auf die Gegenwart: 11 vols., Leipzig: Leiner, 1900, vol. 11: 'Geschichte der Juden vom Beginn der Mendelssohnschen Zeit (1750) bis in die neueste Zeit (1848)', p. 287. Reprint of the edition of last hand: Berlin: arani, 1998, ISBN 3-7605-8673-2. ↑ Reversed at the dissolution of the grand duchy in 1815. ↑ On February 22, cf. Heinrich Graetz, Geschichte der Juden von den ältesten Zeiten bis auf die Gegenwart: 11 vols., Leipzig: Leiner, 1900, vol. 11: 'Geschichte der Juden vom Beginn der Mendelssohnschen Zeit (1750) bis in die neueste Zeit (1848)', p. 297. Reprint of the edition of last hand: Berlin: arani, 1998, ISBN 3-7605-8673-2. ↑ On March 11, cf. Heinrich Graetz, Geschichte der Juden von den ältesten Zeiten bis auf die Gegenwart: 11 vols., Leipzig: Leiner, 1900, vol. 11: 'Geschichte der Juden vom Beginn der Mendelssohnschen Zeit (1750) bis in die neueste Zeit (1848)', pp. 297seq. Reprint of the edition of last hand: Berlin: arani, 1998, ISBN 3-7605-8673-2. ↑ By order of the Sultan, equal rights were granted to non-Muslims, including Jews, in 1839 as part of the Tanzimat reforms. ↑ Introduced on December 12, 1848. ↑ By introduction of the basic freedoms as decided by the National Assembly, adopted for Hamburg's law on February 21, 1849. ↑ By the Constitution of Denmark of June 5, 1849. ↑ By law on the Affairs of the Jews in the Duchy of Holstein on July 14, 1863. ↑ For the status of Jews in the states, which united in 1871 to constitute Germany see the respective regulations of the principalities and states that preceded the 1871 unification of Germany. Christian Wilhelm von Dohm. Über die bürgerliche Verbesserung der Juden (Berlin /Stettin 1781). Kritische und kommentierte Studienausgabe. Hrsg. von Wolf Christoph Seifert. Wallstein, Göttingen 2015, ISBN 978-3-8353-1699-7. Hyman, Paula E. The Jews of Modern France. Berkeley: University of California Press, 1998.